Finally - an easy way to get daily chizuk in Shmiras Einayim. Guaranteed to bring you more kedushah, shalom bayis & serenity! *We will not share your email or number with any third party. Pesach is a time where Hashem doesn't have any prejudgments about us. Our nation was born even from within the 49th level of impurity. As any normal human who walks the streets and browses the internet in the 21st century, we all face the challenge of keeping our eyes pure. 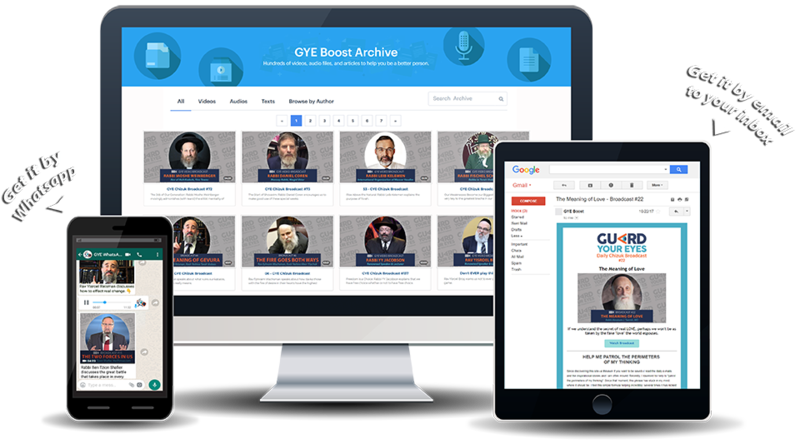 GYE Boost brings 2-5 minute audio/video clip to your inbox or Whatsapp each morning, to help you start your day insulated and empowered to be the person you really want to be! Each boost is a condensed dose of chizuk to have the maximum impact in under 5 minutes. Get inspiration from some the best minds and orators in the Jewish world. If you’re using a Kosher phone, this option is for you. Have the boost become part of your email checking routine. The most convenient way to follow the boost. 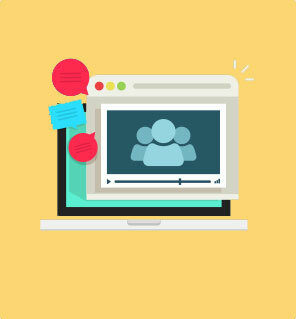 The clips are sent directly to your device, and can be accessed anytime, even when your offline. "I am a high school teacher and I am looking forward to using the videos in classes. With today's technology, our youth need so much help to stay strong." "Ashreichem! Everyone is on the spectrum of this challenge in one respect or another. Keep pushing forward to help remove the stigma of talking about kedushas yisrael openly." "This is a great project. As a Water Safety Instructor, the first thing you learn is: "Prevention is half the cure"." "I love how your messages are universal. I've joined shmiras einayim programs in the past and they felt like only people who are really struggling are in them. This is a reality, and we need to be able to talk about this problem openly without it feeling creepy or weird." "I enjoy how your messages focus on the positive perspective instead of guilting everyone with fire and brimstone. Thank you for showing us how Chazal guide us to overcome challenges and rise up after failures." "Thank you for these great Chizuk Broadcasts… Light, positive and informative messages of chizuk are always is in need by everyone." "Thank you... You have helped me reclaim some of my purity." "You are an amazing organization, I had been receiving your Chizuk emails for a long time already, and its כמים קרים על נפש עייפה. Keep it up, Hatzlacha!" In a world inundated with temptation, the pioneering work of Guard Your Eyes is leading the efforts to empower the Jewish community to deal with the widespread challenges of inappropriate material on the internet. GuardYourEyes offers powerful programs and techniques for those whose consumption of inappropriate material has become a compulsive habit or an addiction. Venishmartem has been created to provide an answer to the digital challenges of today's environment. 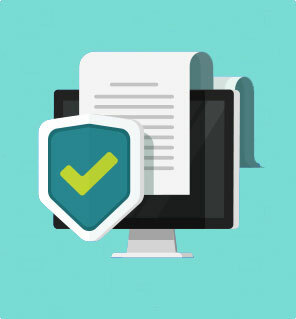 On this website you will be able to find the most cutting edge filtering & reporting solutions for every common internet enabled device, quickly and easily. Print out this flyer to hang in your shul or Yeshivah and bemazakehtherabbim!